Vikram ! This is nicely done ! Yet the door of research is open ! Shall discuss with you later on ! Sure why not. I would love to talk to you. Let’s meet some day. You can join us in our exhibition at India Habitat Center, which is on till 30th November 2012. Nice Article Vikram. As its difficult to make a conclusion here, its good to see that only facts have been provided and discussion is not closed yet. That’s the point Yash. I am not qualified to give a definitive judgement on such a sensitive question. However, I have placed facts for scholars and hope that they will some day be able to find an answer. Interesting read. I especially liked the idea of the ‘Qutub’ being Khwaja Bakhtiyar Kaki rather than Aibak the king. Makes sense. Nice article,sir.It is a very interesting topic..itsreally a big question that why was Qutb Minar so named..till now there is a debate on this topic..but I hope,one day we will get the answer of this question. It is great you are doing detailed research, interesting work. In this regards have you read a book by Dr. Hariharnivas Dwivedi, in 1980, published by Vidya Mandir Prakashan of Gwalior http://books.google.com/books/about/Kirti_Stambh_Kutubminar.html?id=G7yJYgEACAAJ . The name of the book is “Kirti Stambha”, it is a 276 page book. While I do not know if the analysis by the author is correct (better not to make judgements unless one looks at the references properly), he seems to have done a fair amount of detailed research. He also goes into the issue Jam Minar that you have raised in your article above, as also the other Minars in central asia and also China. Since you are working in this topic, it may be good to check out his book. At the very least you will get a number of references that you may not know about now. The book does not seem to be in publication, if you would like to read it and cannot get hold of the book, I can send you a copy. A good friend of mine scanned the book and sent it to me. Nice attempt and good literary research for a beginning. Now, there’re some questions. What makes you think like you replied elsewhere here that the minar was not Hindu. Then, what makes you sure that the Islamist rulers didnt break any temples including this one when hundrreds of their history texts\records\biography loudly observe it? What makes you think that PN Oak was at fault and when he was trashed by court? Even you haven’t reached to a definitive conclusion. What makes you so sure of the complex not being of Varahmihir but of Iltatmish who ruled in 1210 !? Just asking, are you a product of JNU or from Communist group? Keeping that apart. Are you still working on the topic? What else you have? I am also working on it. I’d sure need your hand if you’re doing an unbiased work. if Altatmush built this minar, then who built he temples seen around it? And, which are clearly seen to be demolished beside detailed descriptions in texts? you appear to protect islamic tyrants by saying they merely used the temples destroying it for maing their own minar and mosque. if the islamic were so considerate why they didnt built the mosque elsewhere on a cleaner place? Why not one but thousands of temples were demolished in delhi alone? for raw material? Nice theory. and, who were islamists? Your relative? our relative or sympathizer? who came to bless you with their sword? This work is being belittled by your bias which is well seen. I don’t know the reason you bettr know it. But I know why and who did it and when! You’d know soon. There were 27 Temples, but they were not all Hindu temples. They were Jain + Hindu temples built in different centuries. Pillars from these temples were used to create the Mosque, which we now call Quwwat-Ul-Islam Mosque. We don’t need any RSS proof for this because Qutubuddin Aibak himself claimed it and same is inscribed on the main Gate of this Mosque. Complex was definitely of VarahMihir and I even think that Iron Pillar has a close connection with him because Iron Pillar came from Vidisha and Mihir was employed there by King Vikramaditya (during whose period metallurgy was excelled). We have strong documents mentioning his observatory in vicinity. However, I am confident that the present Qutub Minar or the place of Quwwat Ul Islam mosque cannot be Mihir’s observatory because Ashram is supposed to be slightly off the main temple complex (This itself is a long topic to discuss. Check Vastu Shastra and you will get idea). Besides, we have a stone in the base of Qutub Minar (inside the entry gate) which says ‘Prithi nirapa: stambha:’. This stone is not on its original position. It shows that it is from a Pillar built by Prithvi raj Chauhan. There is a possibility that the pillar/tower was at this exact position, but with the arrangement of stones we understand that this structure is not the one (looking at architecture). Why do I believe that Iltutmish/Altamash built it: Well, one needs to read accounts of travelers and the translations of inscription on the minar. Also match it with the architecture and mortar composition of its predecessors (as compared to one used locally in temples). This information I got from ASI Sup. Arch. Temples were built by Jains and tomars. We have many references in Jain Pattawalis and this area is mentioned as Mihirapuri. I am not protecting anyone. But I am troubled by the biased view of some of us. If you go to Pakistan, they think Hindus as Bad. When you come to India, we think Muslims are bad. When you go to Bangladesh, atrocities are against Buddhist and Christians and if you go to Mayanmar, Buddhists are killing Hindus and Muslims. Why can’t we understand the basic thing that it is just the politicians that force us to look us at one side of coin. Every king destroyed cities that they conquered, ‘IRRESPECTIVE OF RELIGION’. Look at what Ashoka did. Look at what Hindu kings of Kashmir did (when they destroyed temples). And on PN Oak, if anyone has even read a little bit about architecture and archaeology, s/he would understand how illiterate Oak is. I don’t want to spend my energy defending against that person. Sounds good. Please let me know your email address to send it. The total size for the file is ~28 MB. Guru, can you send me the file as well. I’d be thankful if you have anything else on this topic. My id– sanj001@gmail.com. I actually got your email addresses from your contact in the blog and sent the book to your addresses at hotmail, yahoo, gmail. Please let me know if you have not got it yet. I would be curious to hear your thoughts after you have gone through it. If possible can you send me a copy of this book on this mail id. Dear Dutt ji, grateful if you could send me a copy of the book. Thank you. 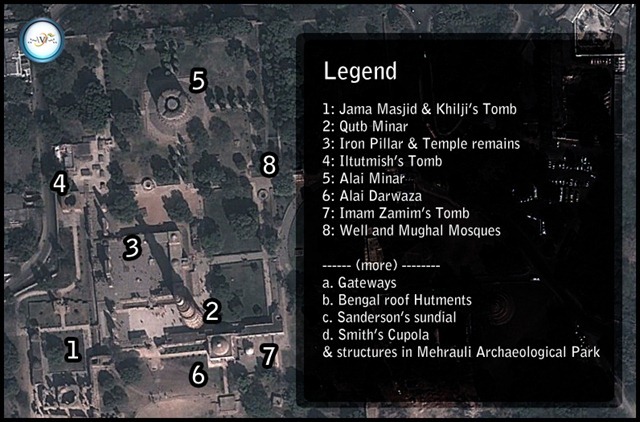 This one is one of the Interesting and very good knowledge about the Qutub complex. The main interesting this is that the stories which written in this post is fabulous. maybe not easy to find out from any other way and also no one will give this kind of knowledge. I am really happy with this. Qutub Minar was a Hindu structure and was known as Vishnudhwaj. This place is not a Hindu structure. However, it is true that 27 Hindu & Jain temples were dismantled from the nearby area and their material reused to build this complex. However, this act must not be seen as a Muslim attacking a Hindu temple because it has been a tradition in India to reuse old building material to construct new structures. For Islamic invaders, hindu temples were an ordinary building because they did not believe in statue worship. We have instances where several Jain temples were brought down by Hindu kings and new Hindu temples created on those place. It becomes difficult to justify such acts without a proper discussion as we need to look at both sides of coin. There are just too many instances of temples being destroyed and mosques being built in place or hindu structure being modified to look like islamic structures. This fact too should be taken into account by anyone hoping to do a meaningful study. vikramjit, at the entrance of quatul islam mosque its written that this mosque was built from the material cannibalized from destruction of 27 Hindu & Jain temples. Its clearly written in Quran the persons who worship idols ( deities ) are the worst unbelievers and its the duty of believers to annihilate them. So the Muslim invaders who destroyed Hindu temples and seats of learning like Nalanda & Taxila were following the tenets of Islam. And as far as your allegation that Hindu kings destroyed Buddhists temples has no material evidence. Last week I visited the Qutub Minar. It was my second visit, after a period of about 10 years. Sadly I did not come across your post before my trip, and have only come across it after doing further research upon coming back. You have presented a very interesting case for reconsidering the attribution. Have you shared your research with the Archaeological Survey of India? 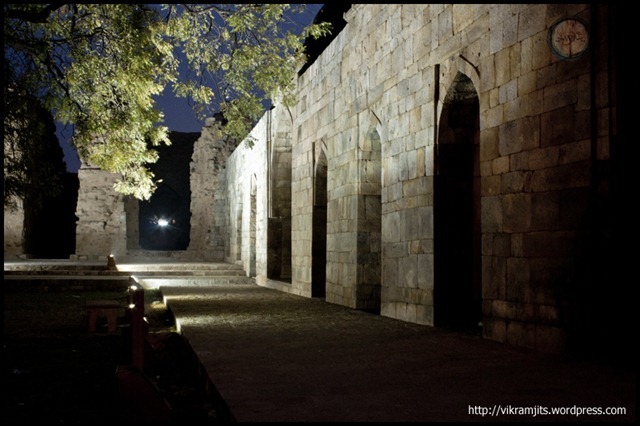 In any case, I have added to my reflection on the Qutb Minar a link to your post. Thanks Rama. I read your article and it is amazingly well written. I love the way you say “when, urged on by politicians”. It is true that entire debate is just because of politicians. What we read in our books is so politically motivated that our next generation is deprived of truth. Thank you Vikramjit for your response here and for the response you left on my blog. I am very glad you appreciated my comment about politicians! promote unnatural social and political harmony. Arabic is rendered Katab Manr. As you Vikramjit-jee concede the Slave King Kutubdin did not built this tower. 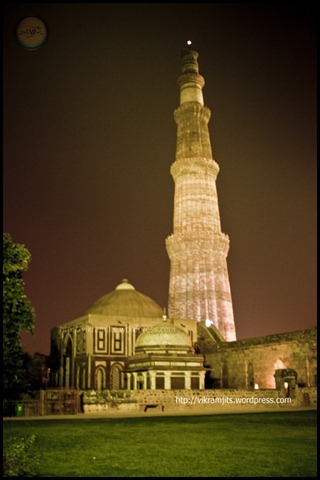 However because it has been assumed in history that he did, it became known as Kutub Minar. William Dalrymple thinks that this was a mosque tower for the muezzins’ call to prayer but he concedes that if you shout from the top it will not reach the bottom. The key to understanding what Kutubdin did is his inscribed boast that he ” destroyed 27 temples” These 27 temples represented the 27 Constellations of Nakshatras of the Hindus. I suggest you visit the Kutub Minar and you will find the 27 Pavilions which KD destroyed were raised around the KM .The entrance to the tower faces North and not West as enjoined by Islam. THE TOWER GIRTHS ( and this is the most significant link of the Tower to the 27 pavilions representing the 27 constellations ) is MADE OF EXACTLY 27 FOLDS . I REPEAT THIS 27 FOLDS OF ARCS AND TRIANGLES ALKTERNATING. Some historians notably William Dalrymple claimed that after destroying the 27 Hindu temples KD then used the shards to build this tower. 1. There is nothing like ‘Katab’ associated with ‘Observation’ in Arabic. Also, if this was an arabic name, ‘Burj’ would have been used instead of the word ‘Minar’. 3. Nowhere it is defined that Islam enjoys West Entrance. Infact, from India, west entrance is not possible because Qibla is towards west and entrance has to be from North, South of East. 4. There are 54 edges, if you count correctly. 27 conical and 27 circular. Also, the 27 temples were not built in a single era or area. Infact, they were not even for same religion. Most of Jain. Few were Hindu, built much later. So concept of associating them with this figure of 27 is baseless. I humbly request you to have the claims verified before you bring them to public forum. Such rumours harm the society. Dear all I have gone through all your thoughts I too have some thing to share which might help your research. I have never visited any of these minars so I marked the location of each minar in google map and found some order in its creation Ghazni , Koina , Jam & Kutabminar. Are all in a row which puts a strong feeling in my mind that this is some thing else. Some other kind of. I cross checked the locations. They are not in a single line. No three of these 4 minarets form a single line. As shown in the images of other minars it resembles nothing similar to qutb minar. If we loo it from the bottom it looks like a flower of lotus with 24 petals just similar to the 24 spokes of Ashoka Chakra. After all, if Muhammad Ghori had built it , it would have been in his capital, Ghazni but not Delhi. But it was not built by ghori. It was built by Iltutmish, who’s capital was mehrauli. Very interesting article Sir.. And that too only factz have been given.. The way u have explained everything is so simple n in a nice n polite way.. Sir did u have did same type of research on TajMahal also as there r many confusions attached with it..? Please let me know so as to avoid the misconceptions or just to know the real facts as u also know half knowledge is always dangerous.. I am working on Taj mahal article too. Problem is that prof. P.N.Oak has created so many misconceptions and illusions, that this article ia taking lot of time. Rest assured, it was never a shiva temple. Every single fact proves that. Statements given by Prof. Oak tell how ill-informed he was about Indian architecture. Please tell the estimated cost of construction of Qutub Minar [required for a school project]. Not sure about the cost. It was constructed in different eras. Last modification was done by British where they added parapet and a folly. Not sure about the cost. It was constructed in different eras. Last modification was done by British where they added parapet and a folly.I am working on Taj mahal article too. Problem is that prof. P.N.Oak has created so many misconceptions and illusions, that this article ia taking lot of time. Rest assured, it was never a shiva temple. Every single fact proves that. Statements given by Prof. Oak tell how ill-informed he was about Indian architecture. interesting article.. what about iron pillar within the vicinity of minar? was it also built by those intruders? It is attributed to Samrat Vikramaditya and was originally erected in Vidisha, Udaygiri. can you please provide the source of all the claims that you have made? I met Mr Janardan Diwedi , ex ASI employee in 2009 when he was 95 years old and he showed me a clipping of news paper where after his research, he told our former PM Indira Gandhi about the truth behind Qutub Minar and Tajo Mahal. As per his research Qutub minar was a solar observatory made during Chandragupta Mauryas time and Taj Mahal was a temple (Refer P.N Oak , The Taj Mahal is temple Palace, Book). I visited Mr Diwedi at his home in Paschim Vihar and saw the newspaper clippings. He is no more with us today. If only Mr. Diwedi had done a little more research, he would have found that Mihirapuri and the Sun Temple was in the vicinity and the existing Qutub Minar is not the same observatory that Varah Mihir used. We have ample records starting from Jain era to Tomar era to prove this. PS: P.N.Oak was trashed by court for creating rumors and giving absurd theories. Very good analysis…..unlike d research by so called modern medieval historians. This is a very interesting article and i am intrigued to know more. Going through the comments, i came across the comment from Mr. Guru Dutt regarding the book Kirti Stambh Kutubminar and was wondering if you could share the book with me. It would be really nice if u could do so. I am very interested in reading the book. There are multiple theories. Most popular is that it was a Victory Tower. We must keep in mind, that both Aibak and Iltutmish have been to Jam, where they have seen the Konye minaret, predecessor to Qutub Minar. But in absence of any definitive proof, we can just propose theories, not final judgement. Vikramjit Singh ji … I enjoyed reading your article, which is thoughtful and well-reasoned. And I especially appreciate the way you stand on what you have found, responding to a whole range of questions and alternate facts calmly and respectfully without yielding your ground. Personally, as a practicing Sufi, I like the idea that Iltutmish named the tower out of respect for Khwaja Qutbuddin Bakhtiyar Kaki. An emotional response, mostly, but I think that even Qutbuddin Aibak would like that, given the importance that many people in that time – and since – placed on the guidance and blessing of the great early Chishti Pirs. There are possibly stories to be uncovered in the family of Khwaja sahib that tell more about this. Narrative sources – despite their easy corruption and embellishment – are often truthful, in fact I think Dalrymple bases some of his research and brilliant reconstructive history on this. As a practicing Muslim, Iltutmish’s proclamation in the Mosque about using pillars and stones from 27 temples may simple have been a testament of devoutness, something he did for this faith, not as an act of disrespect. I personally felt a great beauty in that building, something I also felt in the Aya Sophia in Istanbul, another place that witnessed a clash/synthesis of religious presences. Thank you for such a generous response. Yes. What you say is a possibility. And lack of written documents make it hard to reach a final conclusion. To my knowledge Qutub Minar was flag post , which is there in all temples. The story of qutb minar is doubtful coz the story of king Parikshit death by Takshak Naag is the real story behind The Minar. You can read it in wiki. I interested to make a story on ruins Hindu and Jain temple in qutubminar complex without any controversies. I would like focus on destroy temples. So I want to your support for true information with reference. Sure. Let me know how I can help.